Carol Bynum, left, and Deb Ruddell open ballots to count and then recount them Tuesday at the La Plata County Clerk and Recorder’s Office. 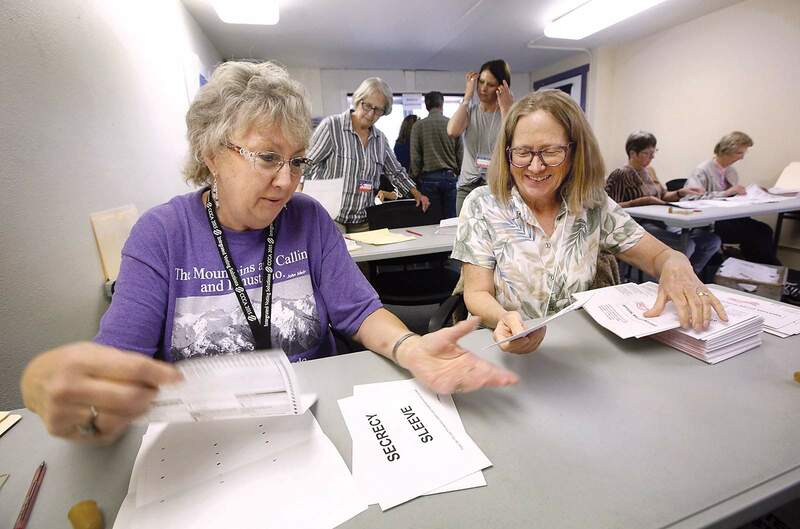 Unaffiliated voters who participated in Tuesday’s primary election helped to increase voter turnout by nearly 10 percent since the last non-presidential primary four years ago, said La Plata County Clerk & Recorder Tiffany Parker. On Tuesday, 10,700 ballots were counted in both the Democratic and Republican primary elections. A total of 10,853 ballots were submitted, but Parker said 122 were rejected because voters turned in ballots for both parties, one ballot was empty, and about 30 were withheld for privacy purposes. It was made clear that unaffiliated voters may only return one party’s ballot, Parker said. With 44,768 active and inactive registered voters, that is about a 24 percent turnout rate. For comparison, during the 2014 primary election, the turn out rate was about 14 percent. The bump in voters can be directly tied to the fact that this was the first election in Colorado where unaffiliated voters were allowed to weigh in on one party’s primary. In La Plata County, 2,368 unaffiliated voters cast ballots. Parker did not have the breakdown numbers Friday on how many unaffiliated residents voted Democrat or Republican. For this year’s primary, 5,012 Democrats and 3,473 Republicans voted. Parker said many ballots were returned on the day of the election, which was “pretty impressive.” She said 183 people actually voted in person at the Clerk & Recorder’s Office. She said voting totals will not be officially finalized until July 12. A handful of ballots still needs to be verified, and some military personnel voters are still being tallied, but she does not expect any of that to significantly change election results. It will not be clear for a while exactly what statewide impact unaffiliated voters had on the primary election. Exceeding expectations, 290,639 unaffiliated voters statewide participated in the primary, as of Wednesday’s tallies – accounting for just less than one-quarter of the 1.17 million votes cast in both primaries. Potentially boding poorly for Republicans in November, many more unaffiliated voters opted for the Democratic primary than picked the GOP ballot, even in Republican strongholds like Douglas and Weld counties. That echoed participation by partisans, with Democrats casting about 50,000 more ballots than Republicans statewide, according to preliminary figures. In the primary, more women than men turned out to vote – 627,028 to 538,235 as of Wednesday night, when vote tallies were just short of complete, according to Secretary of State Wayne Williams. And women voters favored Democrats by a wide margin: 361,926 Democratic ballots cast to 250,549 Republican ballots. The spending on this year’s primary was unlike any other because of the open gubernatorial seat and a number of other open statewide seats. 3rd Congressional DistrictDemocrat voters in La Plata and Montezuma counties overwhelmingly chose Diane Mitsch Bush to challenge Republican U.S. Rep. Scott Tipton for the 3rd Congressional District. Bush is a three-time former state representative and Steamboat Springs resident. Mitsch Bush told the Grand Junction Daily Sentinel that she made the rural economy and the region’s environment top issues during her campaign, and will continue to do so through to the November election. “We’re talking how we can bring our country back and how we need a representative who will work for an economy who will work for everyone,” she said. GovernorThe eight primary candidates – four Republicans and four Democrats – represented the largest Colorado primary since World War II, who collectively have poured more than $25 million into the governor’s race, the most in state history, counting general election spending. Democrats fielded candidates with views much to the left of their current titular party leader, John Hickenlooper, the moderate, business-minded former Denver mayor who might have a place on a national ticket in his future. In the Democratic race for governor, Cary Kennedy won in both La Plata and Montezuma counties with small margins. Voters in both counties chose state Treasurer Walker Stapleton for governor. jromeo@durangoherald.com. Colorado Politics reporter Joey Bunch contributed to this story. To see results of other races, visit https://bit.ly/2Ke32Az.